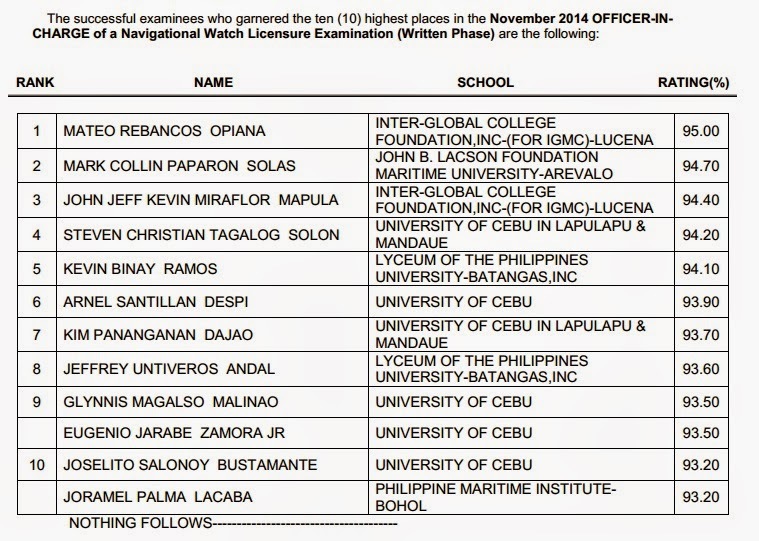 Those awaiting results of November 2014 Marine Deck Officer board exam may find here the complete list of passers, top 10 (topnotchers), top performing schools and performance of schools as the Professional Regulation Commission (PRC) officially released results on Wednesday, November 19, 2014. PRC announced that 40 out of 114 passed the Master Mariner Licensure Examination, 263 out of 678 passed the Chief Mate Licensure Examination and 1,329 out of 2,529 passed the Officer-In-Charge of a Navigational Watch Licensure Examination given by the Board for Marine Deck Officers in Manila and Cebu. A total of 61 examinees are exempted from taking the practical examinations as they opted to submit a Certificate of Training and Certificate of Assessment in the Ship Simulator and Bridge Teamwork (SSBT). The members of the Board for Marine Deck Officers who gave the licensure examinations are Capt. Jaime D. Aquino, Chairman; Capt. Ireneo U. Delos Santos, Capt. Romeo C. Abuyuan andCapt. Marsolito A. Cruz, Members. The results were released after two (2) working days from the last day of examinations. successful examinees in the said examination WILL BE ANNOUNCED LATER.